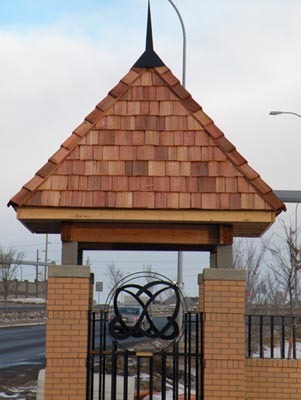 Description: As part of the interchange improvement at Douglasdale Boulavard and Deerfoot Trail the original entrance feature for the community of Dougladale was removed. Trevcon Enterprises has been contracted by Alberta Transportation to rebuild the entrance feature. The work involves building concrete foundations and three brick wall structures complete with metal and cedar accents. Lighting and landscaping work is also being completed as part of the contract.